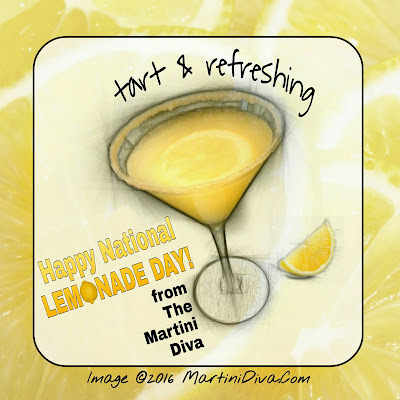 LEMONADE MARTINI for NATIONAL LEMONADE DAY! 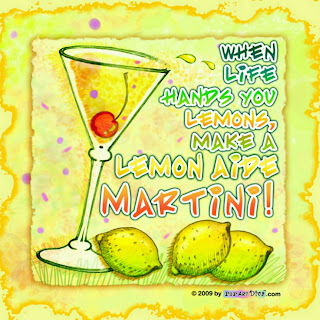 If you add booze it's Lemon Aide! Nothing is more refreshing on a hot summer day than an ice cold glass of fresh lemonade . . . . with booze in it! Lemons have some great health benefits, their acidic qualities bring out the flavors of foods and adding a twist of lemon to a cocktail always perks up the taste buds. The fruit itself is packed with tart goodness and the rind (zest) is loaded with lemon oils which are like nuclear powered lemon magnificence. The ancient Egyptians believed that eating or drinking lemons would provide an effective protection against a variety of poisons, and today's knowledge of the health benefits of lemons confirms this. Lemons are known to have antibacterial, antiviral, and immune-boosting powers. Rub the rim of the glass with the slice of lemon, dip rim into the lemon sugar crystals then chill glass in freezer. Add all the ingredients to the cocktail shaker, shake until chilled then strain into the chill glass. Garnish with the lemon twist and serve. 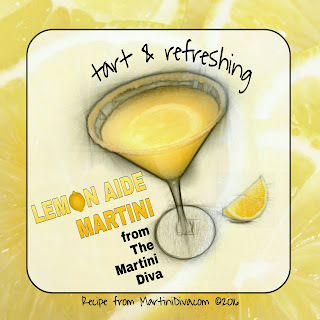 Get the Lemon Aide Martini Recipe on Recipe Cards Here.